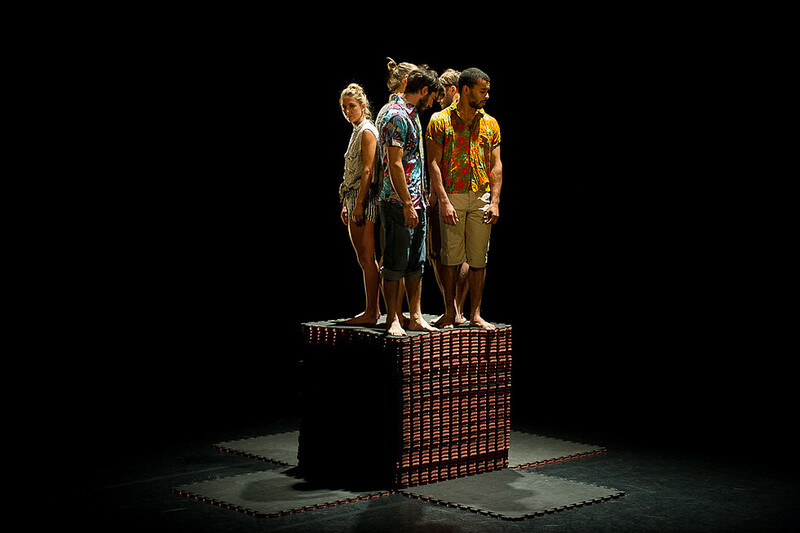 Pile-en-face consists of five young artists of different disciplines such as hand-to-hand, object manipulation and acrobatics. Together they have created a performance that has an interesting combination of smooth movements, a philosophical approach and a clear vision of what is needed to tell a story. Pile-en-face has created a performance about the inevitable search for meaning in life. A search for meaning often goes hand in hand with the absurd. What do people do when confronted with the absurd: they get the compulsion to find meaning where none exists. Throughout the performance, the characters try every method of confronting it. “The sum of what we do” is a visually absurd search for the meaning of life by using stacked pieces of a puzzle. The performance has a strong basis in the absurdist philosophy of Albert Camus and Samuel Beckett and their famous play “Waiting for Godot”. This up-tempo performance is easy to digest dispite the philosophical layer that is below the surface. This outstanding piece of contemporary circus is definitely recommended for families.